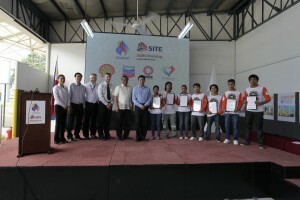 BEST Palawan scholars who are ‘graduates’ of the center and presently employed at the Keppel Subic Shipyard as part of the MP3 Project were honored at the event by Petilla and executives from the Malampaya Joint Venture partners, SITE Group International, Keppel Subic Shipyard and MFI. Honoring BEST scholar Bebian Batul [far right] with a certificate of recognition are [from r-l] DoE Secretary Carlos Jericho Petilla, Shell Philippines Exploration, B.V. (SPEX) Managing Director Sebastian Quiniones, Malampaya Project HSSE Lead Neil Burton, SITE Group International CEO Vernon Wills, Keppel Subic Shipyard President Leong Kok Weng and Malampaya Foundation, Inc. (MFI) Executive Director Karen Agabin. 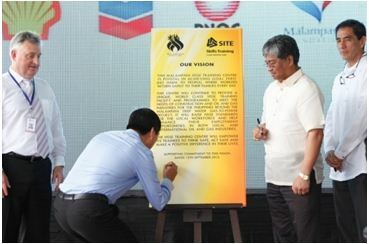 The event’s highlight was the unveiling and signing of the Malampaya HSSE Training Center ceremonial marker which symbolizes the Malampaya consortium’s commitment to develop Filipino capability to meet the high standards of construction and oil and gas industries. Unveiling the Malampaya HSSE Training Centre ceremonial marker and signing their commitment to achieving its goals are SPEX Managing Director Sebastian Quiniones [6th from right] and DoE Secretary Carlos Jericho Petilla [5th from left] with [from l-r] Shell Vice President for Projects Operated Graham Henley, DoE Energy Resource Development Bureau Director Rino Abad, SITE Skills Training Manager Jaime Purves, SITE Group International CEO Vernon Wills, Chevron Malampaya Asset Manager Sabino Santos, PNOC-EC Vice President for Upstream Operations Raymundo Savella, MP2 and 3 Project Manager Antoine Bliek, MP2 and 3 HSSE Team Lead Neil Burton and Keppel Subic Shipyard President Leong Kok Weng. 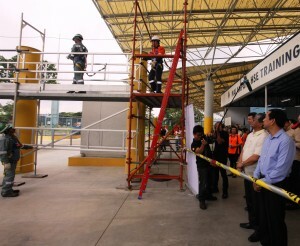 After the formal opening, SITE trainers lead the attendees on a tour of the center. 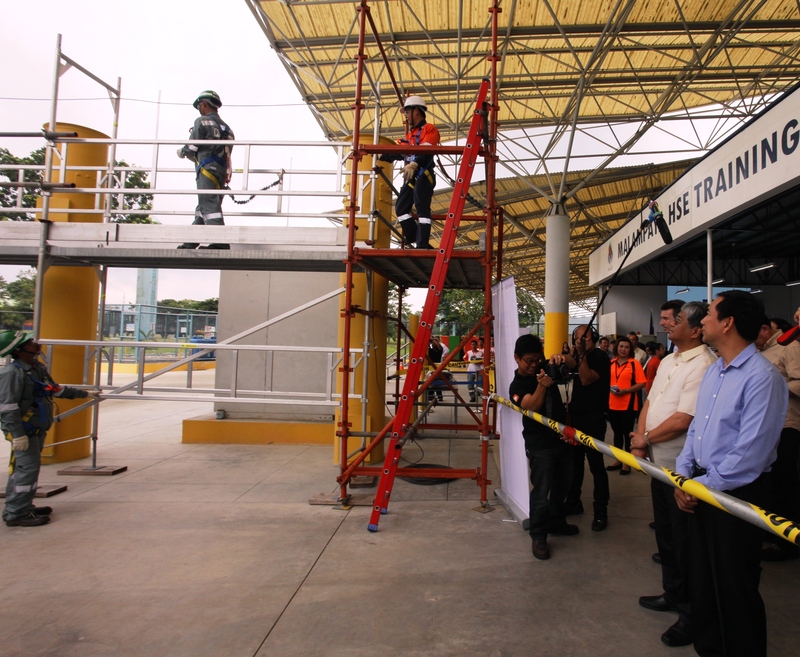 In photo, [from r-l] Petilla and Quiniones watch a demonstration on proper and safe working from heights. Developed and operated by Shell Philippines Exploration, B.V. on behalf of Joint Venture partners Chevron Malampaya LLC and the Philippine National Oil Company-Exploration Corporation under Service Contract No. 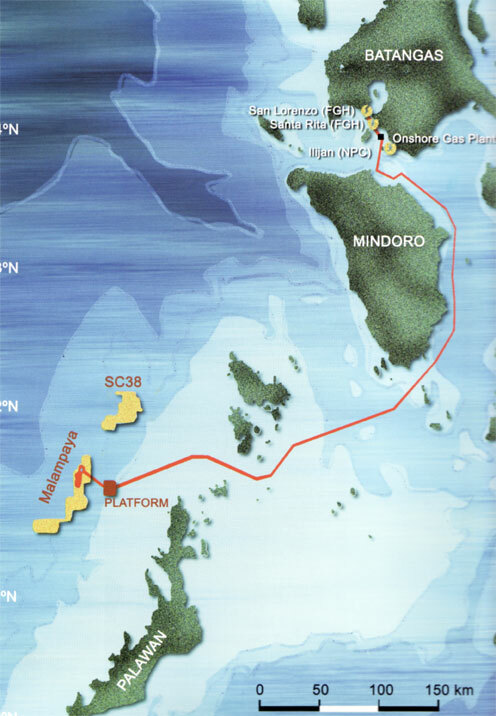 38 (SC 38), the technologically innovative Malampaya Deep Water Gas-to-Power Project is one of the largest and most significant industrial endeavors in the Philippines on gas technology, supplying 40-45% of Luzon’s power requirements with cleaner-burning natural gas. 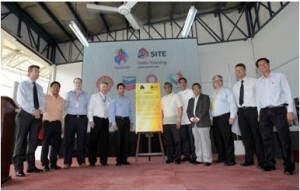 It is a joint venture undertaking between the national government and private sector, spearheaded by the Department of Energy.